No need to shop around for all the little extras to go with your timber – we have it all in one place. And we’ll even throw in our expert advice for free! Whether you’re building a wooden fence, deck or any other type of DIY project, chances are we have all the materials you need. 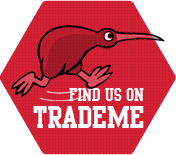 Check out our specials on Trade Me or come see us for some trusty advice from seasoned timber specialists.